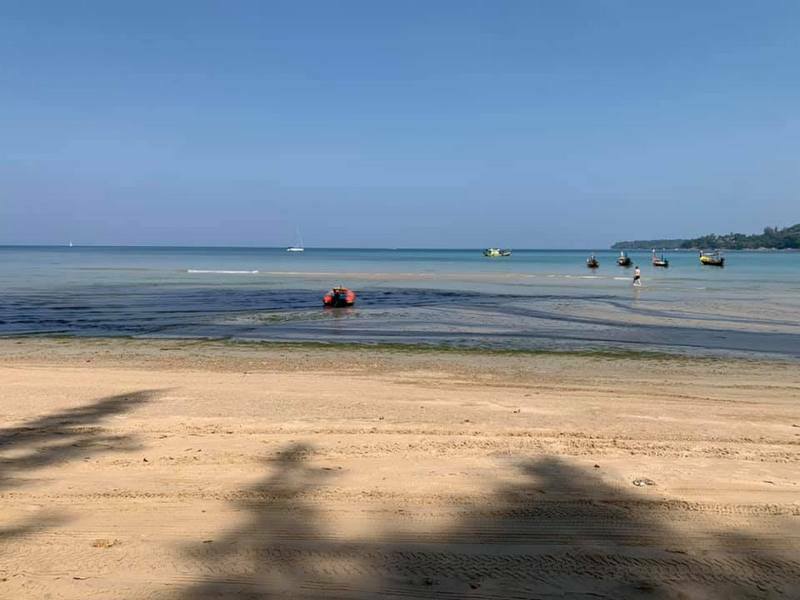 PHUKET: The Kamala Tambon Administrative Organisation (OrBorTor) has vowed to raise the issue of the black water running across the sand and into the sea southern end Kamala Beach with the Phuket Governor while the local authority works to clear the water and find the source of the pollution. 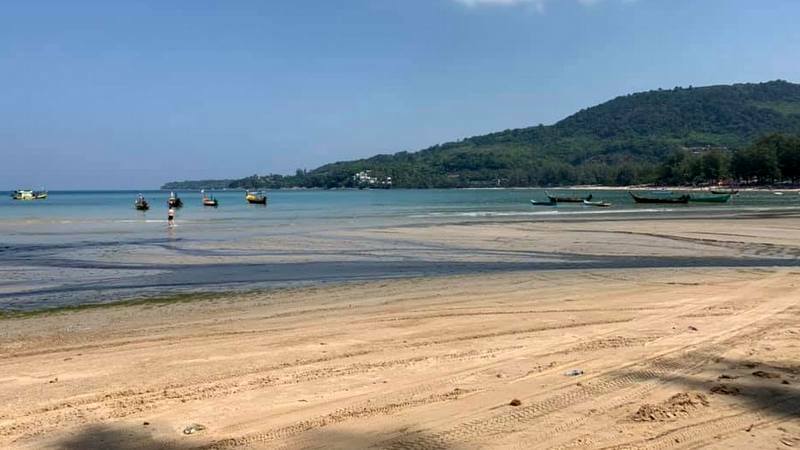 Kamala OrBorTor Deputy Chief Nopporn Karuna told The Phuket News today (Feb 25) that effective micro-organism (EM) balls were being prepared so they can be deployed throughout the Pak Bang Canal to mitigate the concentration of of contaminants in the water. “Now we are preparing to add EM balls to the canal as quickly as possible. Also, we will remove the black sand and soil from the canal,” he said. “The EM balls will be deployed tomorrow (Feb 16),” he added. Meanwhile Kamala OrBorTor officials are working their way upstream to locate the source of the pollution, he added. “Today, we are conducting inspections to locate where the dirty water is being released into the canal. It may be from housing communities or local businesses. 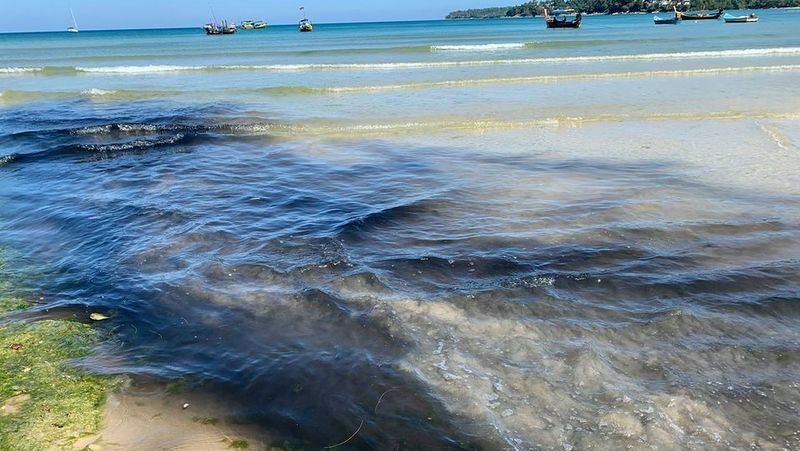 We know it’s not the Sun Palm or the Sun Wing (hotels), or Phuket FantaSea, as they have the correct wastewater systems installed,” he said. Mr Nopporn explained that his office was first informed of the black at the popular tourist beach on Friday (Feb 22). “The black water flowing across the beach and into the sea is a serious issue. I will raise this with Phuket Governor Phakaphong Tavipatana for his suggestions about what we can do about this problem,” he said. 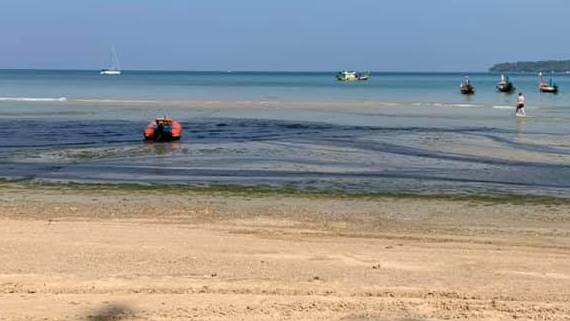 However, Mr Nopporn declined to explain what officials are doing about the black water that has already made the beach water where the canal empties into the sea dark and murky. “I must talk with the Phuket Governor,” he said. “We do have plans to have a water-treatment facility installed near the health centre, which is located alongside the Pak Bang Canal, but it will take more than a year before work can start on that. “It is a long-term plan,” Mr Nopporn stressed. Kurt...the entire town is a polluter, and the OrBorTor is complicit in that for decades they have rubber stamped projects without requiring any pollution control. They also lack any kind of long term comprehensive plan to deal with pollution, currently and into the future. Kamala OrBor Tor conducted  inspection on 25 and probably 26 Feb. Is there already news to report about the outcome of that inspection? Who are the polluters? Once in a blue moon there are in Kamala 'conducted inspections' after the release of contamination. But the Kamala Officials never come back to us with the outcome of these so called 'conducted inspections', what make me now asking: ..Are these inspection really happening or just a fake thing?.. It is not rocket science. Plug all the blue lines and see where the wastewater backs up. It will back up into in every house and every business, because everyone has put in drain lines illegally. Water pollution associated with illegal discharges to the environment is beyond being a chronic problem...it should have been addressed 20 years ago. “Today, we are conducting inspections to locate where the dirty water is being released into the canal.." Well, you wont have to look far...every business and house discharges whatever they want into the magic drain holes and creeks. It is pointless to do this unless you have a plan to do something about it, which you don't. You can start by looking at all the blue lines. In real life all three canals are heavily polluted at the moment. it's not difficult to see who is responsible for the northernmost one unless one's pockets are being filled to turn a blind eye. Blackwater is caused by hypereutrophic conditions and lack of oxygen. The paddle systems used in prawn farms might help but the what needs to be done is the wastewater input is cut down. .." It is along term plan'.. Yes, a plan that should have been executived 3-4 years ago! It is a many years contaminated water flowing! Black or not black. .."I must talk with the Governor".. Yes, and the governor has no professional clue, he just will say..'clean it up'..  And these EM ball nonsense, pffff. Ineffective, when it concerns contamination. Just show..